Researchers previously believed contrast sensitivity function—the minimum level of black and white that a person needs to detect a pattern—was mainly dictated by the optics of the eye and processing in the brain. 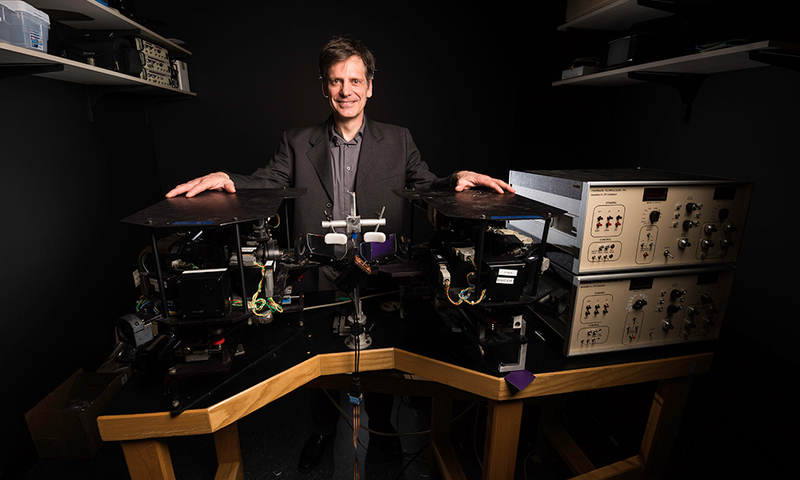 Now, in a study published in the journal eLife, researchers, including Michele Rucci at the University of Rochester, explain that there is another factor at play: contrast sensitivity also depends on small eye movements that a person is not even aware of making. TEST YOUR CONTRAST SENSITIVITY: The Pelli-Robson test is one type of test to measure contrast sensitivity. The test consists of a chart with six letters per line, and contrast varying from high at the top left to low at the bottom right. To test your contrast sensitivity function, read the letters starting with the highest contrast in the top left, until you are unable to read two or three letters in a single group. Each group has three letters of the same contrast level. Think of a scene or object like a computer image made up of different pixels, or points. Each point is a different color, intensity, luminance, and so on. Our eyes take in signals from each of the points and project the signals onto photoreceptors on the retina: the arrangement of these points makes a spatial pattern that we perceive as a scene or object. But, if a spatial pattern is projected as a stationary image, it will fade from view once the retina’s photoreceptors become desensitized to the signal—like a student who becomes bored in class if the teacher repeats the same information over and over again. In order to measure contrast sensitivity and whether or not eye movements play a role, the researchers showed human participants gratings with black and white stripes. The researchers gradually varied the width of the stripes, making them “thinner and thinner, until the participants eventually said they no longer saw separate bars,” Rucci says. The width of the bars is known as the spatial frequency. For each spatial frequency, researchers measured the minimum level of black and white that participants needed to be able to see a contrast, while, at the same time, carefully measuring their eye movements. 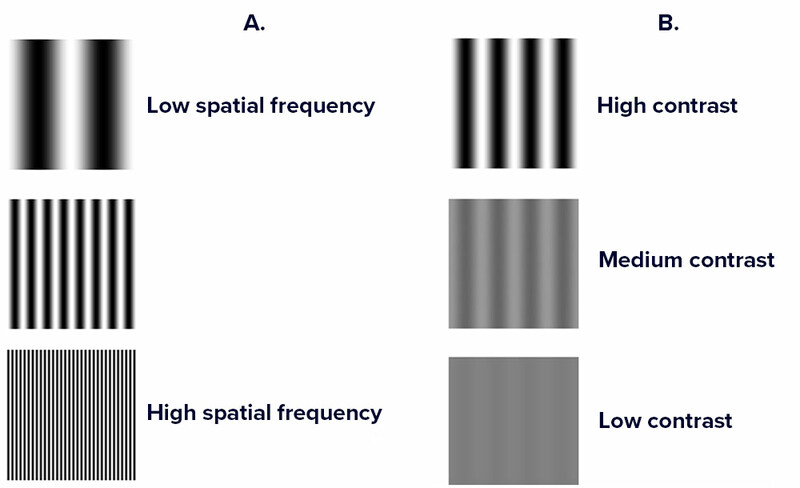 To measure contrast sensitivity, the researchers showed human participants gratings with black and white stripes of different widths (known as spatial frequency, image A). For each frequency, they determined the minimum amount of contrast (separation from black and white, image B) that would enable the subjects to still see the grating pattern. The resulting function of spatial frequency is known as contrast sensitivity function. 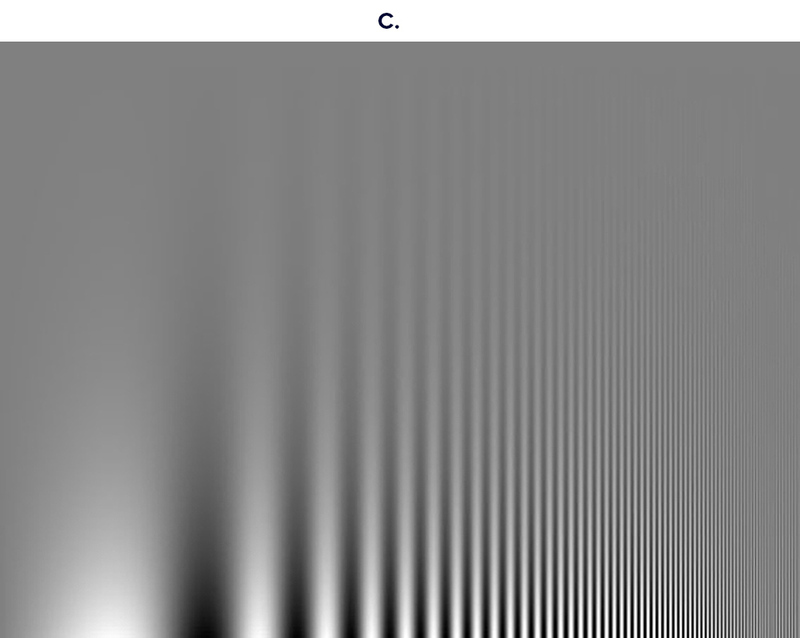 You can see your own contrast sensitivity function in image C, where frequency varies on the horizontal axis and contrast varies on the vertical axis.